Peregrine Company is southwest Michigan’s answer to luxury, high-end spaces in both the residential and commercial development realm. Our apartments include superior, concierge customer service and clean, contemporary design in both Douglas and Kalamazoo with the option for furnished apartments. The commercial properties boast ideal locations in the center of downtown Kalamazoo. We also offer many parking options in Kalamazoo’s central business district. The bulk of what Peregrine Company is today started as a hobby for our owner, Tom Huff. Born and raised in Kalamazoo, he witnessed the decline of the city’s downtown and desired to rejuvenate the area. After establishing a career as an attorney, Tom turned his passion for real estate into a way to spur economic development in the area with the creation of Peregrine Company. 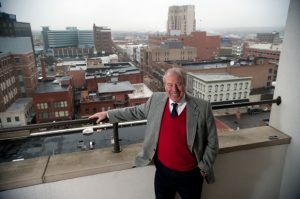 He pioneered the creation of loft apartments in downtown Kalamazoo, the first of which was at 228 E. Michigan Avenue above the Golden Needle Shop. Tom’s innovative thinking also led to the first instance of underground parking below apartment and commercial buildings in downtown Kalamazoo. 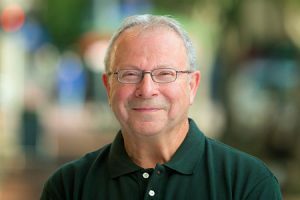 More than 40 years later, Tom is still at the helm of Peregrine Company as Owner in addition to being a practicing attorney and a community leader. Natalie serves as Peregrine Company’s President. 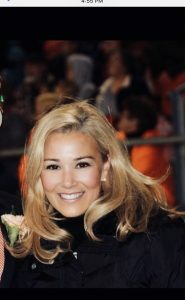 As a developer, property manager, marketer, and licensed real estate agent, she is responsible for evaluating apartment, retail, and mixed-use development opportunities; managing and coordinating development activities related to financing, governmental, design, construction and marketing; and overseeing all accounting and cash management functions. Janine has worked with Tom for more than 40 years. 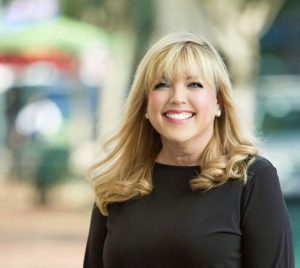 Fulfilling the title of Leasing Manager, she has honed her real estate expertise encompassing the areas of management, operations, and, most importantly, leasing. Janine has a love and passion for what she does and she does it well! Her network of contacts, ability to connect with people, and connection to the community keeps her at the top of the market. She also serves as a legal assistant for Huff PC. With 15 mixed-use buildings containing retail, office, and more than 70 luxury residential apartments all within the central business district, Peregrine Company and its industry-leading team have established themselves as the source for luxurious and high-end spaces in downtown Kalamazoo. In addition, Peregrine also owns and operates five parking lots. We are proud of Peregrine’s contribution to the revitalization of the downtown district and dedicated to the redevelopment of existing buildings to bolster Kalamazoo’s economic impact and create a vibrant future for Kalamazoo as a whole. Now that you know more about Peregrine Company, we would like to know more about you! Please contact us to discuss your needs and desires for apartments and retail, office, and parking space in downtown Kalamazoo and Douglas. We look forward to sharing what Peregrine Company can offer!